Geen 2.0T en ook geen 1.8T. Iemand die dat kan/wil bevestigen vanuit een dealer? Lijkt me speculatie, waarom in de espace een 1.8T met 225 pk droppen (die dus ook in de Alpine gebruikt wordt maar dan met 250 pk). Maar om 300 pk te halen gaan we naar een 1.6 en pakken we niet de 1.8? Haha, lekker hè. Meest logisch lijkt me ook de 1.8 TCe overigens. Ik weet het ook niet, vandaar de 'check', maar hij klonk vrij overtuigend. De 1.6 biturbo's gaan ook hun opwachting maken in de Formule 1, dus wie zegt dat er niet genoeg PK's uit te halen zijn? 1200 pk moet lukken maar de vraag is voor hoe lang, dit seizoen 4 motoren, 6085 km race afstand, dus minimaal 1521 km moet de motor het volhouden. Oranje komt terug op de RS! Ik heb toch al best veel beeldmateriaal voorbij zien komen en toch de nodige (kleine) verschillen gezien tussen het materiaal. Renault Sport is proud to be taking the wraps off New Renault Mégane R.S. at the 2017 Frankfurt International Motor Show. Since the launch of the original Mégane R.S. back in 2004, the model has carved out a strong reputation in the high-performance C-segment and become widely regarded as a benchmark in its class. 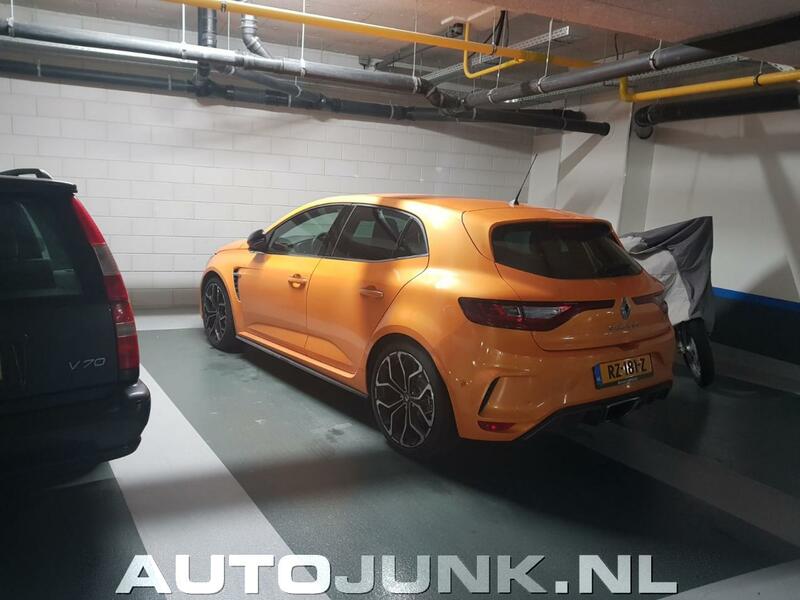 New Renault Mégane R.S. takes Renault Sport’s unmistakeable hallmarks of agility, efficiency and driving enjoyment a step further thanks to a more finely-tuned chassis performance permitted by 4CONTROL technology complete with four-wheel steering, a first in the segment. An all-new 280hp/390Nm engine has benefited from synergies within the Alliance, and, for the first time, New Renault Mégane R.S. is available with a choice of two transmission options. Order books for New Renault Mégane R.S. will open in the UK in spring 2018. Nico Hülkenberg – Renault Sport Racing Formula 1 driver and Renault Sport Cars ambassador. Patrice Ratti – General Manager of Renault Sport Cars. 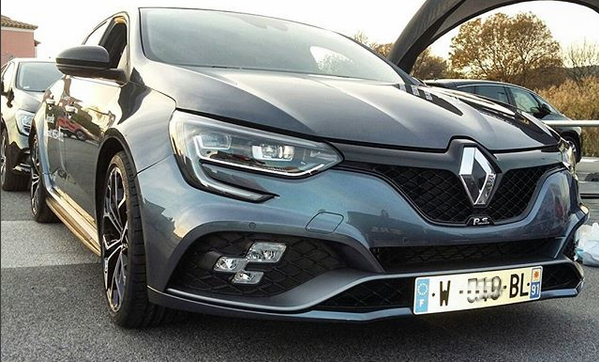 New Renault Mégane R.S.’s expressive, sporty lines point to the model’s performance pedigree and pay tribute to Renault’s longstanding involvement in topflight motorsport. New Renault Mégane R.S. stands out through its specific proportions. 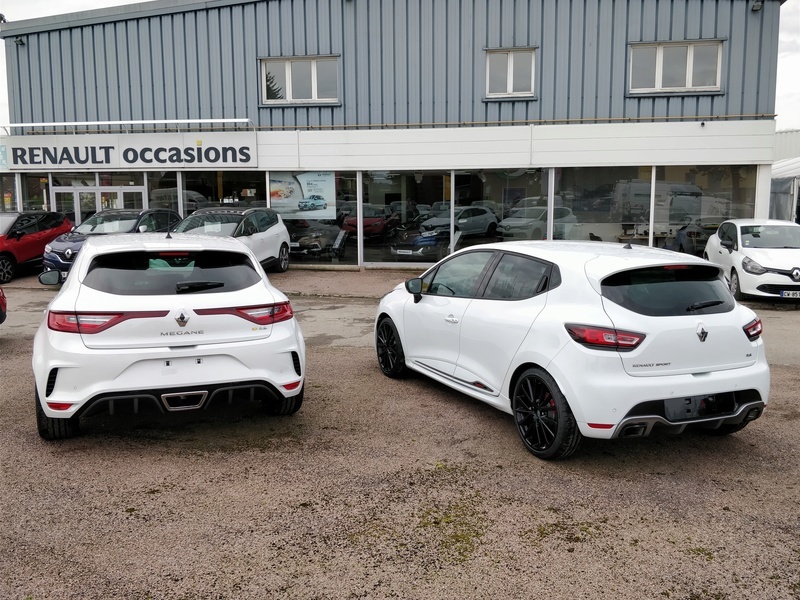 In addition to the bespoke lines of its flanks, including wider wings which have been extended by 60mm and 45mm at the front and rear respectively compared with Mégane GT. Meanwhile, its overall width has been increased and new 18 and 19-inch wheels have been designed to provide a better stance and further enhance cornering performance. - A wide air intake to provide air for the intercoolers and engine cooling. - Extractor vents located behind the front wheels. width of New Renault Mégane. - Mégane R.S. hallmark, centrally-positioned exhaust pipe with a prismatic finish. - Sports front seats with integrated head rests. - Bespoke aluminium pedal and gear lever. Renault Sport took advantage of the presentation of Renault’s latest Formula 1 car – the R.S.17 – in London, in February, to reveal its new logo which is shared by Renault Sport Racing and Renault Sport Cars. 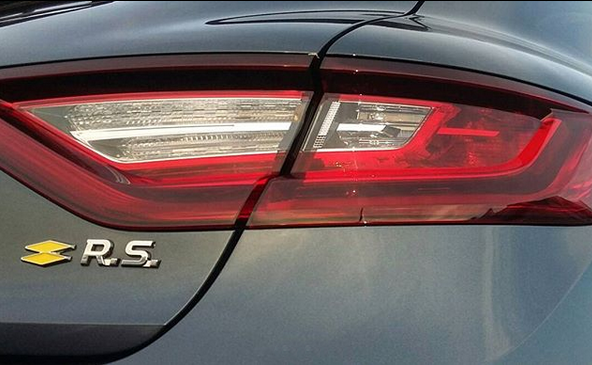 Now, for the very first time, this badging – emblematic of Renault’s sporting heritage – appears on the tailgate of one of the brand’s road-going models – New Renault Mégane R.S. Renault Sport’s acclaimed engineering expertise has taken the performance of New Renault Mégane R.S. to a new level thanks to two new features that are unique in the car’s segment. They ensure a high level of chassis efficiency on the Cup chassis version irrespective of the type of road. Combined with the Sport chassis, they deliver unprecedented comfort in the segment. New Renault Mégane R.S. carries over the key features that helped to forge the success of previous-generation versions. 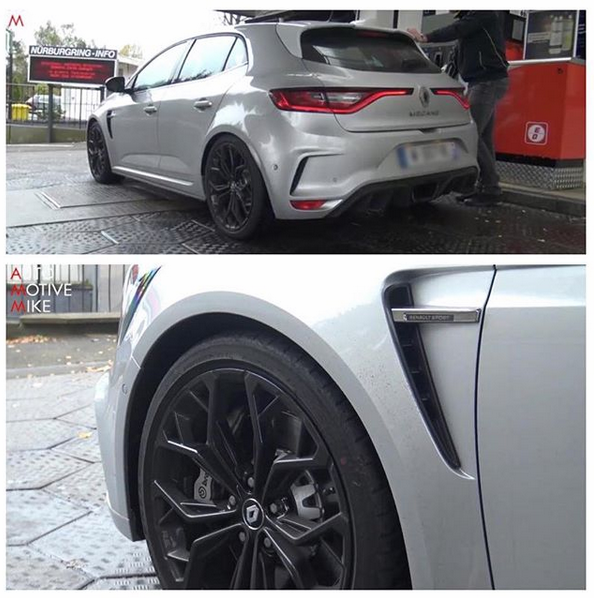 Mégane R.S.’s new geometry and is stiffer than before. acceleration and deceleration for enhanced traction and higher cornering speeds. - The suspension settings of both versions are specific (springs, dampers, bump stops and anti-roll bar stiffness). New Renault Mégane R.S. is equipped with an all-new turbocharged engine equipped with direct fuel injection. it firmly amongst the class’s front-runners in terms of peak torque. - Maximum torque is available from 2,400rpm up to 5,000rpm. 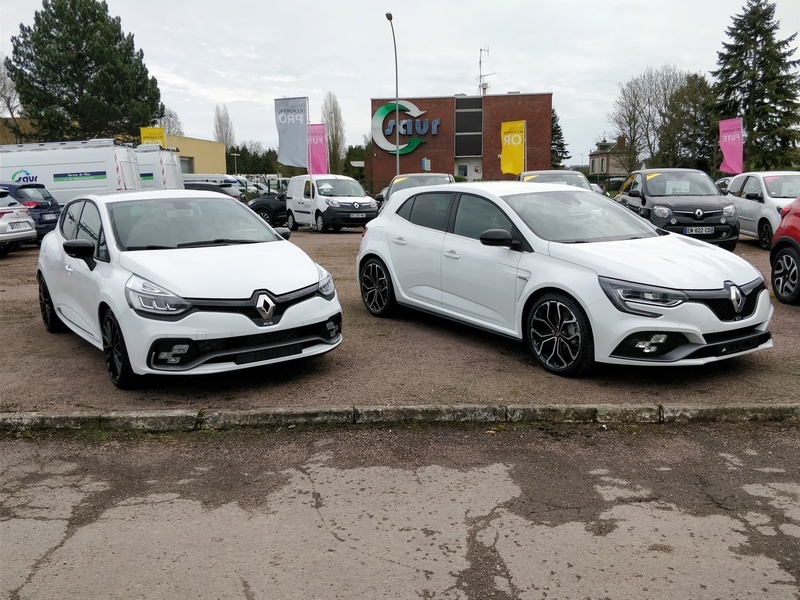 To enable this engine to produce this level of power and torque under the bonnet of New Renault Mégane R.S., Renault Sport focused its development work primarily on the cylinder head, air intake and exhaust. Renault Sport Racing Formula 1 engineers. - The revised, higher-capacity dual-intake air filter features improved permeability. This engine emits 155g/km of CO2 (a considerable 11% reduction compared with the previous generation Mégane R.S. ), while NEDC combined-cycle fuel consumption stands at 6.9 litres per 100km (which equates to approximately 41mpg). 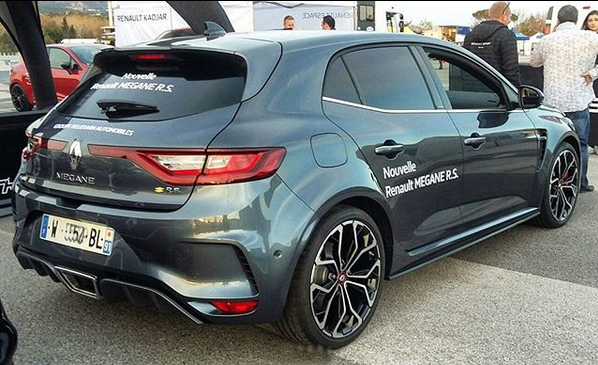 For the first time, New Renault Mégane R.S. offers a choice of transmission for its new 280hp TCe engine. The ratios and gearshift calibration were developed by Renault Sport to combine performance with efficient fuel consumption, while the EDC transmission’s gear shift times have been optimised for greater performance and driving enjoyment. to take their hands off the steering wheel when cornering. textbook start even in low-grip situations. Before the end of 2018, Renault Sport will introduce a Trophy version of New Renault Mégane R.S., the engine of which will produce 300hp and 400Nm of torque. It will incorporate a number of technologies geared to performance, including the Cup chassis and 19-inch wheels as standard equipment. - New 355mm front discs with Brembo callipers. - Optional bi-material cast iron and aluminium brake discs. - R.S. Monitor displays the driver’s performance in real time on the R-LINK 2 screen. incorporation of performance data in the image. They can even share the film on social media. - There is a bespoke website for Renault Sport customers. recordings, playing them back and comparing runs. Already a feature of New Clio R.S., Renault’s multi-reflector R.S. Vision LED lighting system was a natural choice for New Renault Mégane R.S. Taking the form of a chequered flag – another nod to the world of motor racing – it is incorporated in the front bumper and frames the F1-style blade. This patented technology, which is exclusive to Renault Sport, delivers high-performance lighting and includes the fog lights, cornering lights and dipped and main beam head lights. R.S. Vision stands out as an unprecedented lighting package in New Renault Mégane R.S.’s segment to ensure a level of visibility worthy of the car’s high-performance pedigree. Meanwhile, for the first time on Mégane R.S., Renault’s trademark C-Shaped lighting signature incorporates the vehicle’s direction indicators. Renault’s MULTI-SENSE system and its choice of five driving modes personalise the driving experience by adapting engine response (via the pedal mapping), the firmness of the steering and gear shift speeds . - Comfort mode: helps to minimise fuel consumption during everyday use. - Normal mode: the ideal compromise between comfort, acoustics and performance. while the ESC threshold has been raised. agility, with the ESC turned off. The R.S. Drive button provides shortcut access to the Sport and Race modes thanks to a short or long press respectively. Now a five-door hatchback, New Renault Mégane R.S. is even more suited to everyday use, while losing nothing of its dynamic, sporty character. A suite of Advanced Driver Assistance Systems (ADAS) allows it to be driven in all types of situation. - Assist: Reversing camera; front, rear and side parking sensors; and Easy Park Assist (hands-free parking). 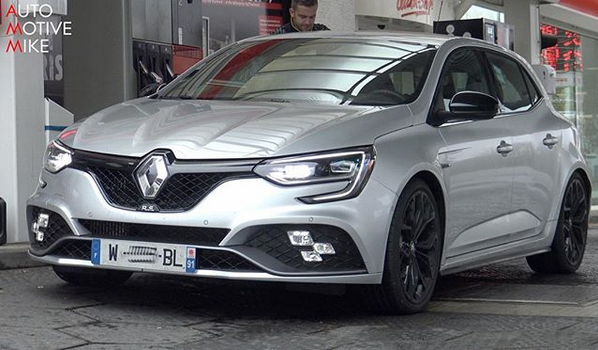 New Renault Mégane R.S. comes with Renault’s high-end R-LINK 2 multimedia system complete with a large 8.7-inch (22cm) TFT display. Ah, Jaune Sirius keert gewoon weer terug. Opvallend wel dat blauw geheel ontbreekt. Het was de introductiekleur van de Mégane IV (GT), en de III RS had ook wel een metallic blauw als mogelijkheid toch? Adinsx wrote: Ah, Jaune Sirius keert gewoon weer terug. Opvallend wel dat blauw geheel ontbreekt. Het was de introductiekleur van de Mégane IV (GT), en de III RS had ook wel een metallic blauw als mogelijkheid toch? is dat rood hetzelfde als op de Clio 4? bozothenutter wrote: is dat rood hetzelfde als op de Clio 4? Kijk een aan, er staat er in ieder geval één op NL kenteken! Wat dik! Al vind ik die sleuven in de achterbumper niet zo. Wat een kanon! Vanmiddag ! En wat een gepruttel en geknal. Klinkt ook in de auto vet!